There’s some deep theology here but I can’t quite articulate it. Any takers? I'm not quite there yet, but for me this is about the Body of Christ, not a human body with a soul. These specific pieces of the Body could have chosen to collectively become something else but they chose, and were chosen, to become an expression of God. Now take those pieces apart and mix them into the bin. How do those pieces affect the others? How are they affected themselves? What will the Body look like in the next iteration? Like I said, I'm not quite there, but that's a raw version, at least. Dane Cook once joked about an atheist who believes that when he dies, there is no afterlife. This atheist had the misfortune of dying alone in a forest. His body decomposed, combined with the soil and fertilised a tree seed. The tree grew, was cut down to make paper, which was then used to print Bibles. The relation between this and the above cartoon is probably remote, but that's what came to mind for me. I also agree with Matt's analysis above. I get an idea in my head to build something out of Legos. So I drag the box out of the closet and sit down in the middle of the living room to start building. I've got this image in my head that I desire to give physical form. But I don't have the right pieces or colors, but for the most part, I can make physical what was my mental reality. I put my creation back in the Lego box without disassembling it. Later, my godkids come over and play with the Legos. Because Legos by nature can be taken apart they disassemble my creation. It's now physically gone. But because I am creative in nature, my creation still exisists by my will and imagination. So later on, I go to the Lego store and get a bunch of pieces of varying size shapes and colors and a tube of superglue. I sit down and make my image into a physical form again, but this time perfect with all the right pieces–and glued together. Of course I'm making something from other somethings, not like God makes something from nothing. But the truth of it is, God's idea of us IS reality. By his will we are. And his will of what we are is that we take physical form. 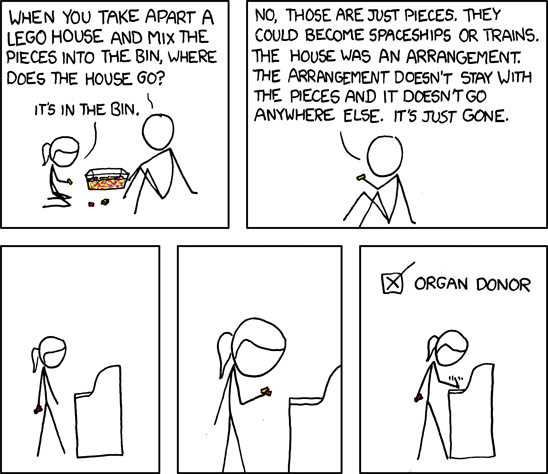 xkcd is wrong. As long as the girl has the image of the house in her creative mind and the will to maintain that image and recreate it later, the house is not really gone. The soul is the will of God for a person to be. I feel like I'm talking in circles…is any of this making sense? Buddhism jumped out at me – don't get too attached to this physical form because when you're gone you're gone, and you might as well give your organs away to someone who can use them so you'll get some good karma and come back in the next life as a spaceship. Right?